You can access the vTools management interface from the My Services portal http://myservices.interoute.com. Click the Products menu and select VDC 2.0. vTools should appear as a tab within the window labelled 'VDC'. Alternatively, use the 'VDC 2.0' tile by clicking the 'VDC 2.0' heading to open the VDC window. If the tile is not open on your dashboard, click Add tile at the bottom of the window and choose the VDC 2.0. In the 'Monitoring: Virtual Machine Name' window, a status icon appears against each monitor type (CPU, RAM, etc.) showing the monitor state for that aspect. Wherever it appears, the 'Unknown' (question mark) icon can signify either that the VM was not reachable by the monitoring server or that the monitor check could not retrieve the required information. To set or change alarms, click the alarm icon for the VM property or service that is of interest. In each case, you can set the threshold values for a 'warning' alarm and a 'critical' alarm (except for Connectivity, which has fixed thresholds). Tick the Notifications Enabled box to turn on notification of alerts by email. In the monitoring window for a VM you can display graphical charts of the historical data for the different properties and services. Click the chart icon to open the chart viewer for that property or service. The data sets normally contain all the data for the period since the VM was deployed and connected to vTools services. Only one chart window can be displayed at one time. Each chart window can show multiple data plots. Usually one (or few) of these will be selected initially. Click the data name in the legend underneath the chart to show or hide any of the plots. Plots may use different vertical scales, which are colour-coded same as the plot line, and may appear at the left-hand or right-hand side. Tooltip function: Position the mouse at a point on a data plot and a tooltip will display the values of the nearest data point. Download: Click the context menu button at the top right corner to print the chart, to download a copy of the current chart image (in PNG, JPG, or SVG format), or to download the source numerical data in CSV format. With CSV, you can pass the data into any analysis or graphing tool for further inspection. Monitor message: Below the chart, the most recent monitoring data is displayed. Each VM is checked by the monitoring server every 5 minutes. In case a new alarm is detected a repeat check is run one after minute to make sure the alarm is persisting. Therefore in the worst case it will take up to 6 minutes for an alarm to be reported by vTools. When an alarm state turns off (that is, the VM becomes 'healthy') there will be a maximum delay of 5 minutes for the monitoring server to query the VM and report the change. Monitoring data is updated every 25 minutes. The icon next to CPU shows the monitor state. The 'Unknown' (?) icon can signify either that the VM was not reachable by the monitoring server or that the monitor check could not retrieve the CPU information. CPU usage/load: for Windows this is percentage loading, as reported by the Windows OS. For Red Hat this is process loading as reported by the Red Hat Linux OS (the averaged number of processes waiting in the process queue - as shown by the Linux command uptime). CPU usage/load: this will be a percentage loading value for Windows, and process loading value for Red Hat. Packet loss: Packet loss as a percentage. 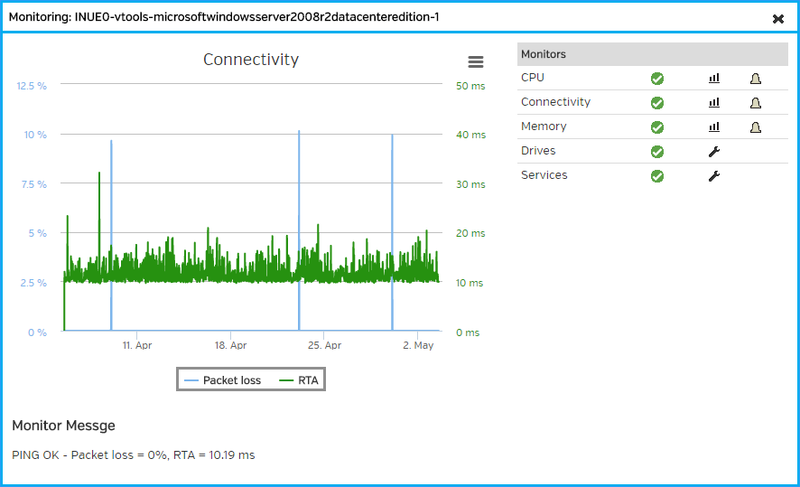 RTA: Round-Trip Average in milliseconds, between the vTools server VM and the monitored VM. Click the alarm icon to set or change the alarms. Alarm thresholds for connectivity are preset (see tables above). The icon next to Memory shows the monitor state. The 'Unknown' (?) icon can signify either that the VM was not reachable by the monitoring server or that the monitor check could not retrieve the Memory information. The charts available for Red Hat are as follows. The meanings of the different physical memory usages are as defined for the Linux free command. Units are MBytes. Memory: Total memory used (physical and virtual) for Windows, or the amount of 'used' physical memory for Red Hat; specified as a percentage, or an actual amount in units of MBytes or GBytes. For Drives, click the spanner icon to show the list of monitored drives. For each drive listed, there are three options: view charts, set alarms, or delete the monitoring for this drive. Free: Drive free space in MBytes. Free %: Drive free space as a percentage of total space. Click the Back button to return to the Drives list. Disk free space: The amount of free space, specified as a percentage, or an actual amount in units of MBytes or GBytes. Alarm is triggered when amount goes below the set threshold. Click the Add button to add a drive to be monitored. You can also set up alarms at the same time. For a Windows VM, enter the Drive letter. For Red Hat Linux, enter the mount point. For Services, click the spanner icon to show the list of monitored services. This data records whether a service is detected as running (value 1) or not running (value 0). A number of services are setup for monitoring by default. You can add other services to be monitored by clicking the Add button. The Service name is case and spaces sensitive, it must be typed exactly. For Red Hat Linux, any service from the list of the files ending in '.conf' in the system folders /etc/init and /etc/init.d .